Native American children represent the future generations that will carry out the traditions and customs of their tribes. As we approach the international “Dia del Niño” (“Day of the Child”) holiday on April 30, we wanted to share the history of this celebration and more on how PWNA supports literacy for children in reservation communities. “Dia del Niño” originated in Mexico in the early 1920’s and is now observed across Latin America and other countries in the world, including the U.S. The day recognizes the importance of children in society and promotes their well-being. Today, many organizations make use of this holiday to promote child language and literacy, including the American Library Association and the Association for Library Services to Children. This day in time promotes the importance of reading by linking children to books, languages, and cultures in the home and at school. Unfortunately, many Native American children struggle with reading and according to the National Center for Education Statistics, American Indian and Alaska Native students score lower in reading than non-Native students in grade school due to education system issues, under-funding and other barriers. 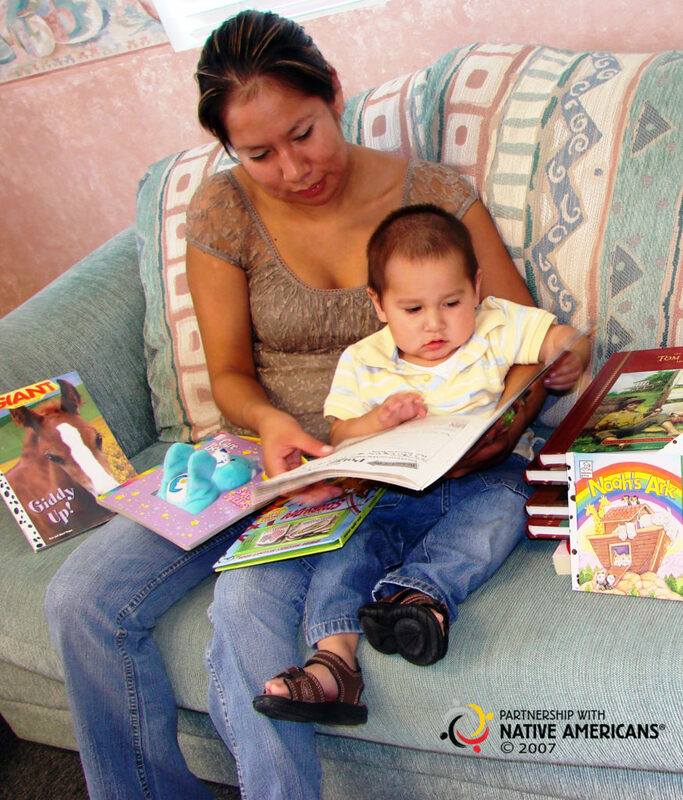 PWNA’s American Indian Education Fund (AIEF) program is committed to improving literacy on reservations by giving Native youth access to reading materials and encouraging volunteers to support reading time. AIEF partners with community programs such as Boys & Girls Clubs and Head Starts to help stock books for students who may not have access at home or through a local library. Children are encouraged to participate and check books out so that reading becomes instilled as a regular practice in their lives. Regular reading helps improve reading comprehension. Some partners also promote literacy buddies so that students and parents or older students can read books together. This “Día del Niño”, we encourage you to celebrate the magic of reading by sharing your favorite culturally relevant Native American children’s book with any young readers in your life. April 22 is Earth Day, a day of environmental awareness and activism across the world. Earth Day began as a protest in 1970 against the industrial progression of the world and the increasingly adverse impact on the environment and wildlife population. It was a critical moment for environmental awareness. That same year, the Nixon administration instituted the Environmental Protection Agency, and cornerstone protection such as the Clean Water Act and the Endangered Species Act were enacted. 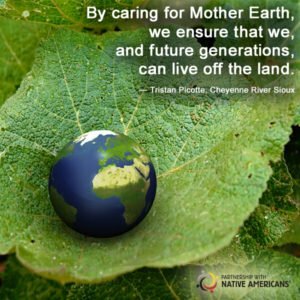 This Earth Day, we recognize how much the environment means to all of us, and especially Native Americans. Many Native people maintain their relationship with the Earth as best they can, whether it’s helping their communities protect the land and water or restoring their relationship to the Earth that was lost over time. PWNA assists tribal communities by focusing on sustainability, recognizing the land and water of Mother Earth are part of the solution. Remote reservations often experience higher levels of malnutrition and obesity akin to some developing countries, resulting from a lack of affordable food, healthy food and sustainable food sources. PWNA supports sustainability projects on the reservations, such as Project Grow and community gardens, that address food insecurity, favor Mother Earth and its inhabitants, and honor our connection to the land. For garden projects in communities across South Dakota and Montana, for example, PWNA provides seeds, tools and gardening training to plant and harvest fruits, vegetables and even honey. There are plenty of resources for starting your own community garden, including Native Food Systems, and the SDSU Extension Office that has tons of information on planting, maintaining and harvesting a wide variety of crops and plants. Our relationship with the Earth is a fragile one that seems to be slipping away from us into a place from which it may never recover. By promoting more projects such as community gardens, we encourage self-reliance, keep our traditions alive and reduce the harmful footprint on our Earth and eco-system. It is my hope that more communities will embrace Earth Day and learn how to protect the environment. By caring for Mother Earth, we ensure that we, and future generations, can live off the land. National Student Athlete Day, created by the National Consortium for Academics and Sports (NCAS), is recognized by National Collegiate Athletic Association (NCAA) colleges and universities on April 6. The day acknowledges student-athletes who excel in the classroom and on the playing fields, all while giving back to their communities through volunteerism and service projects. For us, National Student Athlete Day reminds us of the importance of sports in Indian Country and the Native American athletes and professional teams who support Native causes. Sports can serve as a healthy way for Native American youth who live in remote reservation communities to cope with the everyday stresses and historical trauma imposed on our tribal communities. Native American children have the highest dropout rates of any ethnic group in the United States, with 29 to 36 percent of all Native students dropping out of school mostly from grades 7 to 12, according to the Bureau of Indian Affairs. Participating in sports, however, gives Native youth another way to succeed and excel. In the Northern Plains, basketball — commonly known as “Rezball” — is not only the most popular sport but a way of life. Competitions such as the Lakota Nation Invitational (LNI) and the Dakota Oyate Challenge bring Lakota high school boys’ and girls’ basketball teams together and attract college scouts. These tournaments showcase players who otherwise may not have the opportunity to be seen, given the remote locations of their reservation communities. NFL players Sam Bradford (Cherokee Nation) with the Minnesota Vikings, James Winchester (Choctaw Nation) with the Kansas City Chiefs, Bryce Petty (Chickasaw Nation) with the New York Jets, and Eli Ankou (Ojibwe) with the Jacksonville Jaguars. Though some sports teams have perpetuated negative stereotypes through insensitive team names, logos and mascots, other franchises have supported championing Native American causes. 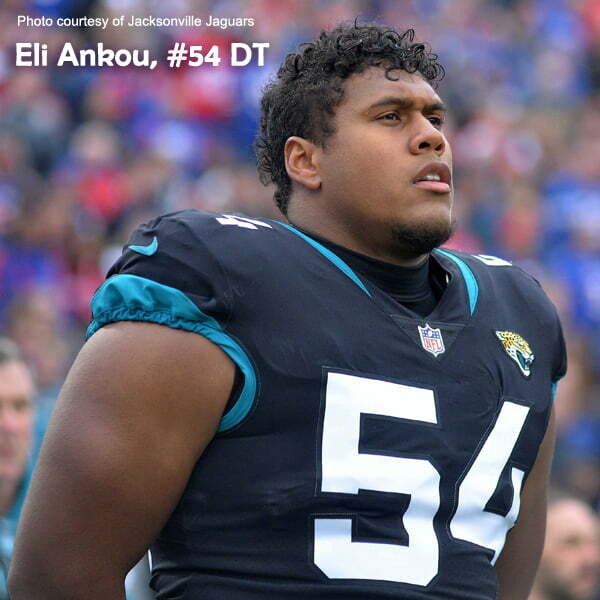 Last year, Jacksonville Jaguar Eli Ankou highlighted the social issues facing Native communities by selecting PWNA as his charity of choice in the NFL “My Cause, My Cleats” campaign. The Dallas Mavericks invited PWNA to give a presentation on Native American history and culture and partnered on a ticket sales fundraiser for a fall 2019 game. National Student Athlete Day reminds us that sports are more than an extracurricular activity. They’ve inspired generations of youth, and especially Native youth to succeed beyond the field and bring hope and confidence in coping with the hardships of life on reservations. 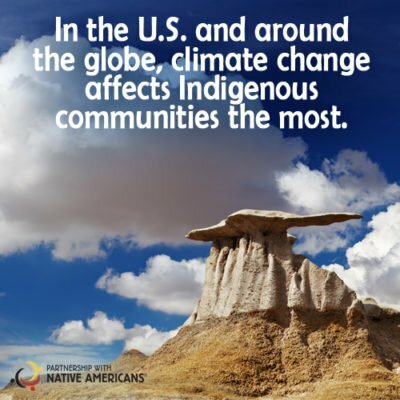 Across the U.S. and around the globe, Native Americans are rallying together to fight against climate change – because although this issue impacts everyone in the world, it has an even greater impact on Indigenous people. According to the Intergovernmental Panel on Climate Change, Indigenous people are more vulnerable to climate change than non-Indigenous people. The panel identified a series of categories that make a community vulnerable to climate change, including proximity to rivers and coastal flood plains, areas prone to extreme weather conditions, and economies that are heavily dependent on climate. Many Native American reservation communities in the U.S. fit into at least one of these categories. The National Congress of American Indians establishing an initiative in 2018 to mitigate climate change impacts on tribes in Washington state. The program aims to increase awareness of the issue to federal leaders, in hopes of motivating change through legislation. Creating the International Indigenous Peoples Forum on Climate Change to bring together government leaders from around the world and educate them about these issues. The DC Climate Change March in 2017, where more than 150,000 Native Americans marched on Washington against policies that are putting their tribal communities in danger. Many Native American leaders are also voicing their concerns about this growing issue, including Lisa Deville, president of Fort Berthold Protectors of Water and Earth Rights and member of the Environmental Protection Agency’s National Environmental Justice Advisory Council. Lisa raises awareness for the need to continue researching climate change and educating on pollution and its impact on tribal communities. Native Americans refuse to turn a blind eye to these issues, and instead are rising up to make a difference. They are also tackling climate change through other avenues, such as taking a lead on other green trends, such as renewable energy and sustainable housing. World Water Day was established to recognize the importance of fresh, drinkable water around the world. With so many communities – including entire countries – without a reliable source of water, this year’s theme of “leaving no one behind” sheds light on the issue and emphasizes water as a basic human right for all. Today, we are bringing attention to the exceptionally high scarcity of water that plagues American Indian reservations across the United States. For decades, access to clean water has challenged residents of the Navajo Nation who routinely haul water for drinking, cooking and other household needs. Particularly due to mining, Navajo, as well as Hopi, lands have contaminated water sources with high amounts of uranium and arsenic. 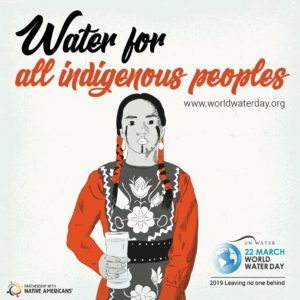 Environmental issues such as the 2015 EPA spill of three million gallons of wastewater in the Animas and San Juan rivers also impact clean water for indigenous communities. Infrastructure in remote reservation communities is often outdated and funding for repairs and improvements is often unavailable. The exact number of reservation homes without water is not easy to find, though across the Navajo Nation one in five families hauls water, and stories such as those in Flint, Michigan and Kivalina are in abundance. Infrastructure also causes water outages when winter hits. One winter day when I was about 9 or 10 years old, we accidentally turned off our dripping water, so the pipes in our 60-year-old home froze and broke. We were without running water for months, and a generous neighbor let us fill five-gallon buckets to use for laundry, cleaning and even bathing. This scenario is all too common in reservation homes and results from many factors, such as age of our homes, winter preparedness and a lack of skilled tradesmen. When environmental issues like the EPA spill, or weather emergencies such as blizzards or tornados, impact access to water, PWNA disaster relief services include bottled water and other supplies for the reservations. Water is also included in deliveries that support food pantries, community health fairs and more. In 2018 alone, PWNA provided nearly 58,000 gallons of water to tribal communities in need. Hopefully, aims like “leaving no one behind” and sustainable development will uplift these communities, though this can’t come quickly enough. Today, I hope you will take time to learn more about the water problems facing our communities and what you can do to help. Leadership is an integral part of strong, self-sufficient Native American communities. It takes a committed, compassionate and connected leader to help change a community for the better, and that’s exactly what our inaugural 4D Strong Native Women cohort graduates are gearing up to do. At Partnership With Native Americans (PWNA), our 4 Directions Development Program (4D) helps develop grassroots leaders in the tribal communities we serve. These emerging leaders are offered a unique opportunity to take part in a six-month training program that includes personal and professional development, setting of self-identified goals, and working work with an advisor-mentor, PWNA staff and other resources to reach those goals. 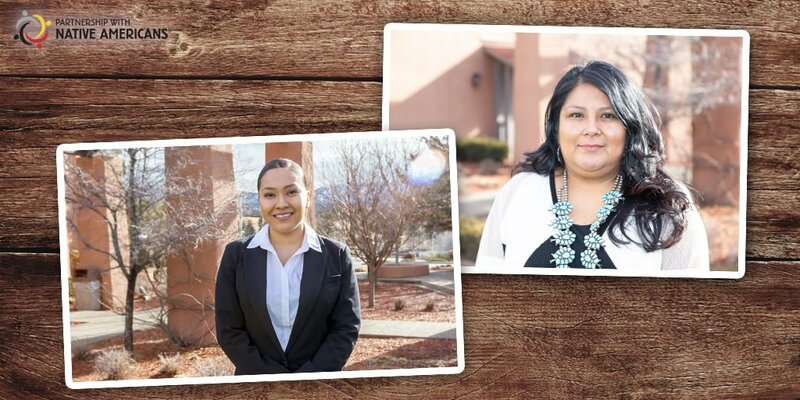 Last October, PWNA launched its first 4D Strong Native Women program, a special all-women cohort supported by PepsiCo Foundation that employs our 4D model but with a focus on roles and issues specific to Native American women leaders. These women represent a diverse cross-section of career, education, families and communities, including Mescalero Apache, Tonto Apache and Navajo nations, and Zuni, San Juan, San Ildefonso and Kewa (Santo Domingo) pueblos. Participants Delana, an administrative service manager for the Zuni Senior Center, and Rosemary Reano, an employment and training center coordinator for the Santo Domingo Employment & Training Office, reflected on their experiences and shared how the 4D Strong Native Women cohort immediately impacted them and their communities. They also commented on the potential long-term impacts of participating in the program. The first session explored “lateral violence” and this had an immediate impact on Delana, who said the training was a “real eye opener,” especially as she came to terms with acknowledging that the behavior was happening right in front of her. Now she can recognize lateral violence (i.e., overt or covert acts of verbal or nonverbal behavior directed toward others) in the workplace. Rosemary has enjoyed the new resources she was introduced to through the 4D program, so much so that she purchased her own set of books used during the training. “I look forward to using these books as tools to develop or motivate my participants in the Santo Domingo Employment & Training Program (assisting youth and adults),” said Rosemary. The inaugural 4D Strong Native Women cohort concludes this spring with eleven graduates. PWNA partners with hundreds of professional Native women who are inspired to serve humanity and do so working in health, social services, community service and education programs. The proportion of women with college degrees in the labor force has almost quadrupled since 1970, and this includes Native women. PWNA’s scholarship program, the American Indian Education Fund, has supported many Native women in furthering their education and the ratio of female to male scholars for the 2018-19 academic year was 6 to 1. With and without college degrees, Native American women are supporting their communities through traditions, culture and balancing of their personal and professional goals. Karen Red Star (Wicahpi Luta Win), is a mother, grandmother, Elder and health educator on the Pine Ridge Reservation in South Dakota. She’s survived a gunshot wound, heart surgery, domestic violence, rheumatic fever and boarding school. She knows a healthy body and mind is paramount to a strong community and Karen models the behaviors she wants for her people. Sharing her grandmothers’ teachings, along with her own college education, help Karen to help others who are fighting for a better, more balanced life. Elisia Manuel serves as Outreach Coordinator for Workforce in Action with the Gila River Indian Community of Arizona. She is married with three children whose joyful faces encouraged her to create the Phoenix-based nonprofit, Three Precious Miracles, where she serves alongside volunteers. Elisia shares, “I believe that we can help transcend trauma through active community linkages and culture for these children who are removed from their homes and placed into homes of other cultures. The purpose of [my] organization is to bridge the gap and provide resources and cultural engagement.” She created this important resource to benefit others, based on her experiences of adoption and love for her children, Telisia, Tecumseh, Jr. and Micah. 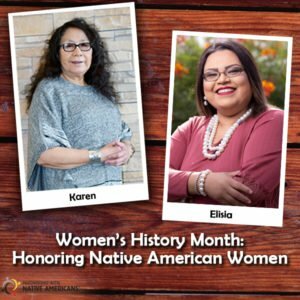 Karen and Elisia are just two such examples of the strong Native women PWNA is privileged to work with in the Northern Plains and Southwest. We applaud all our women partners who are working together to better the world. As 2019 starts to ramp up, we’re already seeing Native American news make national headlines. To ensure our readers stay informed of the news and culture in Native American communities across the country, we’ve compiled our favorite stories from the month of February. Follow us on Facebook, Twitter and LinkedIn and stay up to date with the latest headlines all year long. 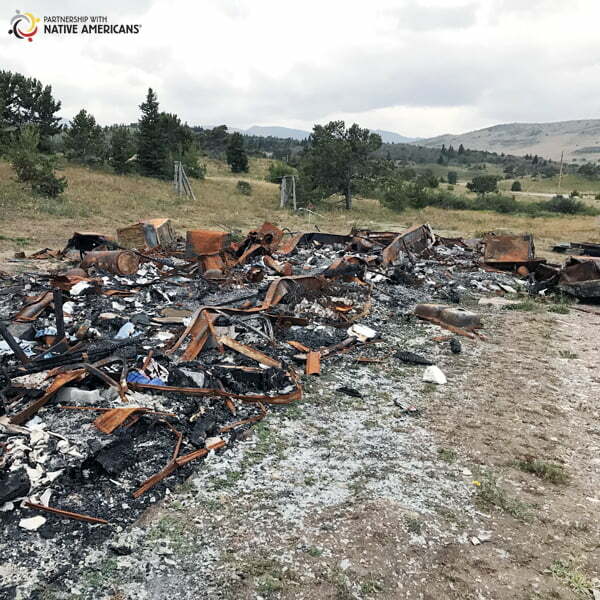 PWNA encourages all Native American tribes and families to read this story as told to us by Elaine BearChild and heed her message as disaster can strike at any time, whether in the form of fire, flood or wind damage. We also invite you to take advantage of our Disaster Resources page; download the information provided, get a copy of “The Native Family Disaster Preparedness Handbook” and be proactive with your family and community to better ensure disaster preparedness on the reservations. Late one evening, Elaine ventured outside to check on her father who was mending a fence. After calling out to him in the dark, she found him lying on the ground behind his truck unresponsive and not breathing, gone, his silence piercing. That was the beginning of a spiral that would last for a year and impact her life for much longer. 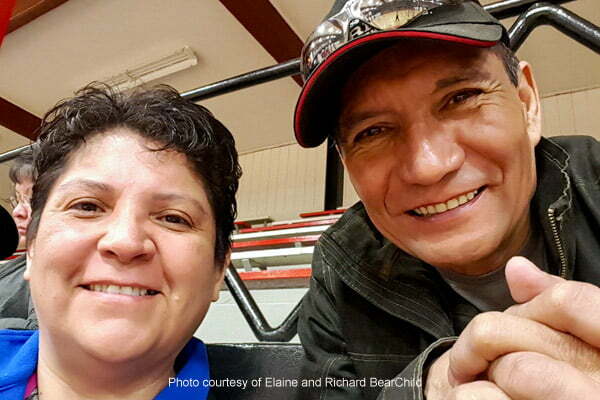 After her father passed, Elaine’s mother who was suffering with leukemia could not live alone. Elaine moved her mom into their mobile home, occupied by Elaine and her husband Richard, their son and two daughters and a pet dachshund. Yet by the next Oct. her mom was in hospice care 2.5 hours away in Great Falls, Mont. Elaine and her family stayed with her mother at hospice for the time she was there. But one Sunday afternoon, this changed too. It was Elaine’s birthday and the thought of celebrating was far from her mind. They were at the hospice and a call came in that their trailer was on fire. The fire department had been called and both Heart Butte and Browning responded, but the trailer burned so quickly that only the frame was left and even it was bent from the heat. Virtually every little thing that Elaine owned was lost… her family photos, her children’s pictures, school awards, a new cook stove and washer/ dryer, a new kitchen table, their furniture and bedding, their clothing… everything was burned to ashes. Daunted by this life-changing disaster, the first 24 hours were a blur. Elaine shared, “Where do you even start when something like this happens?” They called the bank that held their mortgage, hopeful for relief through insurance, only to learn that the “mortgage insurance” did not include “homeowners insurance” or disaster mitigation and instead only protected mortgage payments. She had no way to recoup her financial losses, not to mention the lost treasures of her family’s history and children’s keepsakes. A few months earlier, Elaine’s mom wanted all of them to move out of the trailer and into her home. They had been planning it, but suddenly now it was their shelter from the storm. Elaine and her family were very fortunate in this regard, at a bittersweet cost, and to this day it’s still hard for Elaine as everything in the home reminds her of her parents. Along with the financial loss, the family home and sentimental treasures lost, and the total disruption of an organized family life, this all took a tremendous emotional toll on the whole family. Elaine shared that counseling helped, but she is still recovering… remembering yet another thing that burned in the fire, still buying things they previously had.